The Shortnose Gar is currently ranked as "S1" in Montana because it is at high risk because of extremely limited and/or rapidly declining population numbers, range and/or habitat, making it highly vulnerable to global extinction or extirpation in the state. Due to it's recent observations upstream into the Milk River and 70 miles upstream into the Yellowstone River, a new rank assessment may be performed. 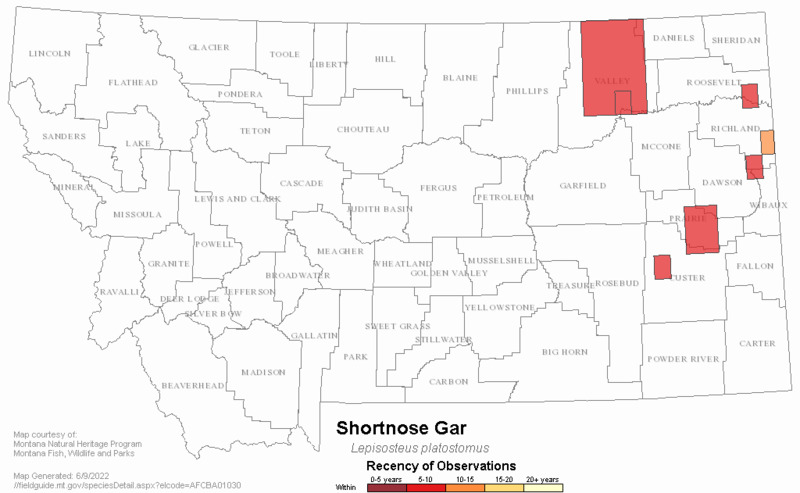 The gar family has only one representative in Montana, the Shortnose Gar. This fish is native to Montana and has been previously found at only one location--the dredge ponds below Fort Peck Reservoir. But more recent collections (2010-2015) have reported this species in the the Milk and the Yellowstone Rivers. 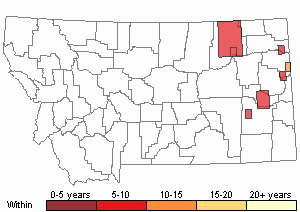 Because of its restricted distribution and limited population size, it has been named a Montana state Fish of Special Concern. Gars are predaceous. They are spring, broadcast spawners. They have several unusual features including rectangular scales found only in primitive fishes, and a gas bladder that can function like a lung. All fish have gas bladders, which they use to regulate their buoyancy, but the gas bladder of a gar can extract the oxygen from air that is swallowed. Consequently, gars can survive in waters that have very little oxygen where most other fish would perish. Gar eggs are poisonous to humans. This prehistoric-appearing fish is cylindrically shaped, with an elongated bony head and snout containing one row of sharp, conical teeth. The dorsal fin is located well posterior and the pectoral and pelvic fins have no spots (Marshall 1966). The skin is covered with diamond shaped ganoid scales arranged in oblique rows, providing a very protective surface armor (Moyle 1993). Scales number 60 to 64 along the lateral line. Color varies from brownish or olive-green on the dorsal surface lightening to yellow on the sides and white on the belly (Holton and Johnson 1996). Young gar less than 10 inches in length process a black stripe along the midline. Shortnose Gar may reach a size and weight of about 31 inches and about 3.5 pounds (Montana AFS Species Status Account). The shortnose gar is widely distributed throughout North America within the Missouri and Mississippi River system. 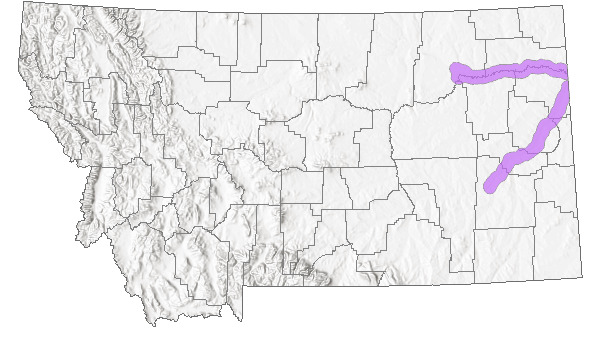 However, its distribution within Montana was initially thought to be very limited with occurrences being documented primarily in the Missouri River dredge cuts downstream of Fort Peck dam (Brown 1971). 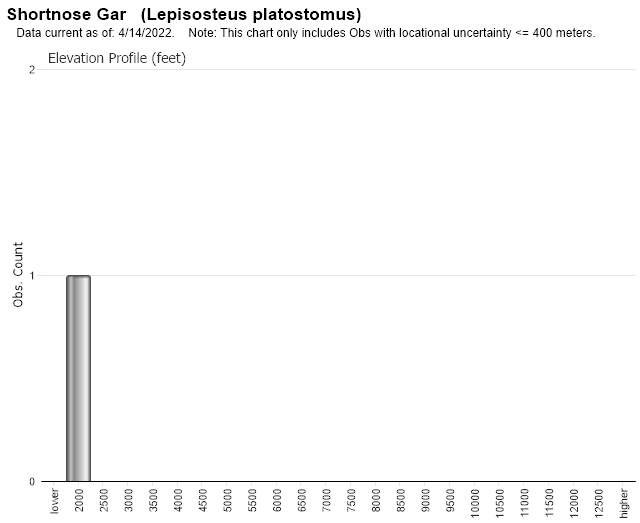 But other more recent documented observations of shortnose gar in Montana are from specimens collected on the Yellowstone River ~70 miles upstream to intake and ~10 miles upstream into the Milk River. Shortnose gar are not known to migrate for spawning purposes. Shortnose Gar are typically found in large rivers, quiet pools, backwaters, and oxbow lakes. It has a higher tolerance to turbid water than the other four gar species found in North America (Montana AFS Species Status Account). They are found in dredge cuts below Fort Peck Dam (Holton 2003). The diet of the Shortnose Gar is primarily composed of fish. However, crayfish and insects are also utilized (Brown 1971). Young gar are known to feed on small insects and zooplankton, with fish entering the diet when gar are 1.25 inches in length. Gar is known as fierce predators of smaller fish using ambush as a primary hunting technique (Moyle 1993, Montana AFS Species Status Account). 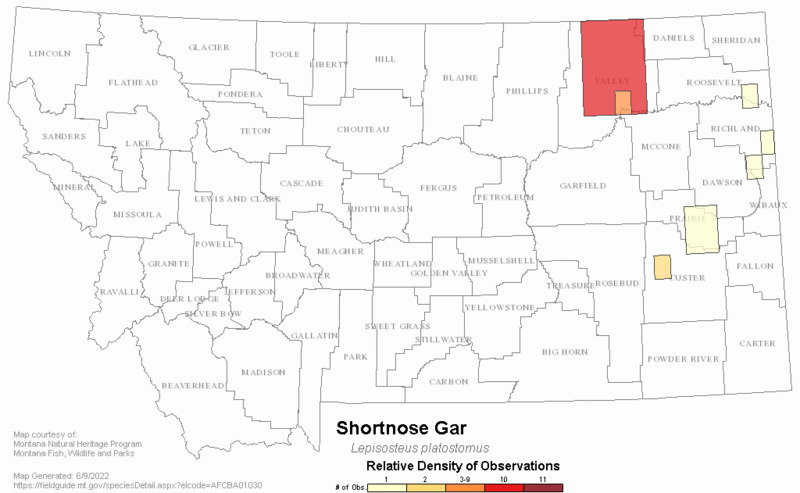 Due to their limited distribution, little is know about shortnose gar within Montana. Shortnose gar are typically found in large rivers, quiet pools, backwaters, and oxbow lakes. They have a higher tolerance to turbid water than the other four gar species found in North America. Gar also have the unique ability to supply a high vascularized swim bladder with supplemental oxygen by engaging in a behavior of "breaking" where air is gulped at the surface. Shortnose Gar become sexually mature at three years of age and typically spawn in May or June as water temperatures reach the mid 60s (Brown 1971). Adhesive eggs are deposited in quiet, shallow water over aquatic plants or other submerged objects. A sticky, gelatinous adhesive holds clumps of yellowish-green eggs to the vegetation for 8 to 9 days whereupon hatching occurs (Montana AFS Species Status Account). The young lead solitary lives floating near the surface (Brown 1971). Due to low numbers and poor quality flesh, the Shortnose Gar is not considered a sport fish in Montana (Montana AFS Species Status Account). Holton, G.D. 2003. A field guide to Montana fishes. 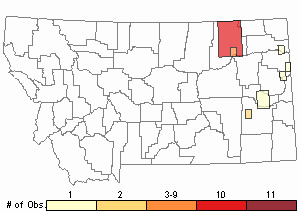 Montana Department of Fish, Wildlife and Parks, Helena, MT. 104 pp. Marshall, N.B. 1966. The life of fishes. World Publishing Company, Cleveland, OH. 402 pp. Moyle, P.B. 1993. Fish: An enthusiast's guide. University of California Press, Berkeley, CA. 272 pp. Web Search Engines for Articles on "Shortnose Gar"